Currently, there are 6 amateur exemptions to the first major of the year. Winner and runner up in the previous year’s US Amateur, winner of the US Mid Am, winner of the British Am, winner of the Asia-Pacific Amateur, and now the winner of the Latin America Amateur. For the most part, all of these players are going to miss the cut. But there are actually quite a few graduates of these exemptions that went on to do great things. Tiger for one, played in the Masters on US Am exemption twice. Jack Nicklaus did as well. And even recently, Hideki Matsuyama won the APA and played in the Masters before turning pro. Decent list to be on, even ignoring the multitudes of other players to have that honor. This time around, watch for Bryson DeChambeau, defending Am champ who’s going to turn pro next week at the RBC Heritage. But to mention that, we’re getting ahead of ourselves. You win the Masters, you get to play forever – or at least until the committee subtly tells you you’re too old to play anymore. But that means along with the bad young guys, we’re treated to a flock of old bad guys! Out of respect, I’m not going to list those guys out. Shoutout to Kenny Perry though. Every year I think of old guys who could have won, and we’d be treated to seeing them every year, but failed. If only Kenny could have won that playoff in 2009, we’d still get to see his smiling face every April. And knowing that makes me sad. Putting PGA Tour live to shame, the Masters has (and has had for the past 5 or so years) great streaming coverage throughout the week. Starting Monday and Tuesday, tune into Masters on the Range where they show, if you couldn’t guess, guys on the range! Wednesday also has the range in the morning, and then switches to showing the par 3 contest in the afternoon. Thursday and Friday morning they have streams of Amen Corner (11, 12, and 13), then 15 and 16 live after, along with a couple featured groups. Best part of the streaming is that the first groups show up on 11 at a little after 10 central time. Which means from that time until the sun sets in Augusta, Georgia you can watch Masters coverage. With ESPN covering the first two rounds along with the par 3 contest, we get the pleasure of listening to Mike Tirico calling the action! 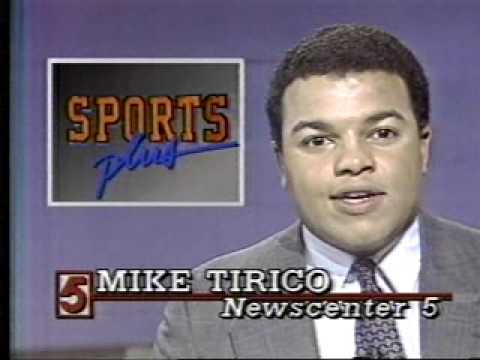 I’m a big fan of Tirico, and it’s especially great that he’s not calling it with Dan Dakich. Holy throwback pic. Not what he looks like now if you were wondering. Think you can get away from him after March Madness? Think again! 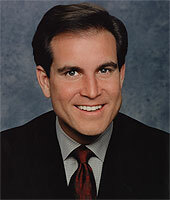 CBS takes over coverage for the weekend, and that means Mr. Nantz is back in the announcers chair. Figure gotta find a pic of young Jim to go with young Mike above. Also, hope you like Jimmy, cause you’ll be stuck with him for the next 20 years if he has his way. Jordan Spieth won at Kapalua, though he really hasn’t lived up to the. He’s not playing badly, finishing T13 at the Shell Houston Open last week, but he hasn’t lived up to his #1 ranking, which he’s lost to… Jason Day, winner at the Arnold Palmer Invitational, and then the week after at the Dell Match Play. Also winning this year are Brandt Snedeker, who won the now defunct Pub Links back in college which meant a Masters invite and unlimited practice rounds, which he took great advantage of, Charl Schwartzel at the Valspar, Adam Scott at Doral, and Bubba Watson at the Northern Trust Open. All these guys have history at Augusta, and winning on Tour this year means they’re primed for Augusta. Slated for Wednesday, the par 3 contest is a way for players to unwind and have a little fun before the main tournament starts. The level of seriousness a player gives to the par 3 contest is varies. Some people play to win, because why not. While others allow their caddies or kids to hit a few shots in their stead. Family bonding time for Tiger. 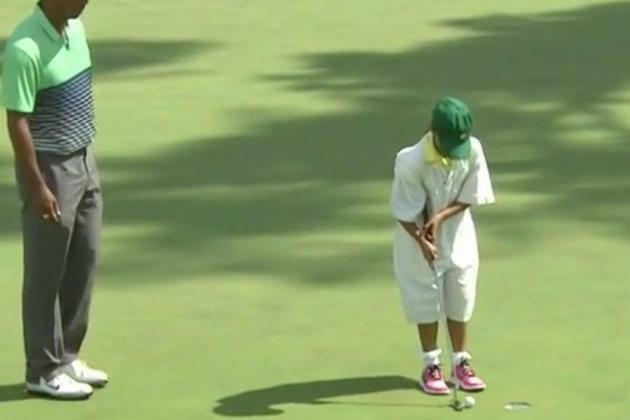 But still, have to post one of my favorite Tiger videos from Augusta. I’m hesitant to call it my favorite Tiger video at the Masters cause he has so many, but it’s definitely top 5. The 13th hole is well known for providing eagle opportunities to contenders. But players having 7 irons into par 5s doesn’t exactly fit with golf, so the Club is close to a deal with a neighboring club which would give the Club room to extend the 13th tee further back, lengthening the hole. That would be quite the curve ball if the deal closed on Wednesday, and they threw up a new tee for the first round. But I’m assuming we’ll have to wait til next year to see the longer hole. But you can be sure the possibility will provide a big talking point this week. All those people outside the ropes at the Masters? They’re not fans, they’re patrons. And don’t you forget it. While the PGA Tour has gotten with the times and allowed cell phones for pictures and texting during their events, the Masters is, as the Masters tends to do, stuck in the stone ages with policies in terms of cell phone usage. Meaning pretty much none on the grounds. One of the best recurring articles in Golf Digest is the Undercover Pro (not associated with that twitter account), and there’s a relevant article about the pro’s dad being detained at Augusta National for the crime of using a cell phone. In one regard, their club, their rules. But they’ve gotta get real. A common occurrence at Tour events is teachers using cell phones for a quick video of a player’s swing on the range. Simpler than carrying around a giant video and computer stand. Can’t do that at the Masters. Teachers also use cell phones for, you know, talking to their students. Let’s say you’re Butch Harmon on the range with Rickie Fowler. When your session with him is over, you know you have to go find Dustin Johnson and watch some of his on course swings. Problem is, Dustin Johnson is on the course, and with no cell phone, you’re going to have to wander the grounds looking for him. Not an ideal situation, and one that could easily be fixed if Augusta National got with the times. Then again, not being with the times makes Augusta National Augusta National. As it is, put those mobile phones away during the tournament. “What do all those funny red numbers mean?!? !” Is something a novice golf fan might be saying to themselves when looking at the leaderboard. 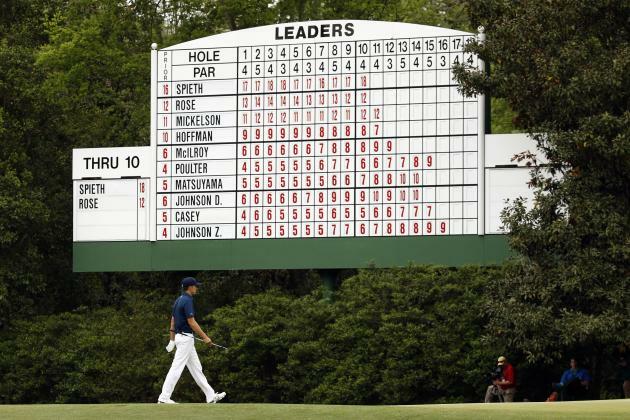 And those style leaderboards are all over Augusta National. Explanation: Each player gets a row, and each column represents a players score after they finish a certain hole. Like normal, red numbers mean under par, black numbers mean over par. Spieth has a red 17 on the 9th hole column, but a red 18 on the 10th hole column. That means he’s currently 18 under, and made birdie on 10. This method might be a little more confusing than the normal leaderboards you’re used to seeing, but it does give more information. Good review. I have seen your all video clip. excellent. Thank you so much for making this website! It has been very useful and awesome.